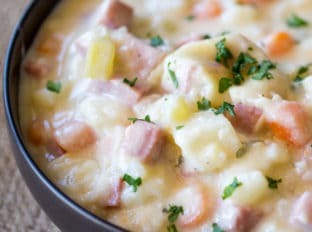 Slow Cooker Ham and Potato Soup that’s creamy, full of vegetables and chunks of ham, finished off with milk and sour cream for a easy and delicious hearty soup. 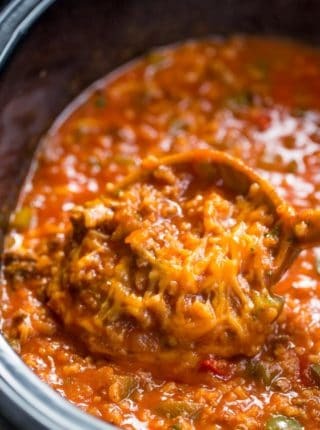 Soups are a big part of the Fall season for us, with their instant “warm you up” abilities and ability to freeze portions or take portions for quickly heated lunches. 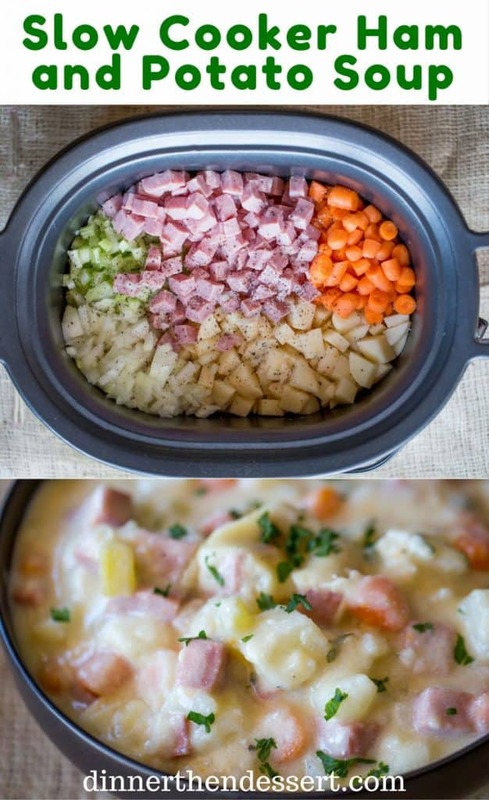 We are constantly keeping out slow cookers going in the winter for soups, especially this Slow Cooker Ham and Potato Soup. This recipe was made in partnership with Smithfield who also sponsored this post for amazing Black Pepper Bacon Biscuits that incidentally would go fabulously with this soup! With less than 20 minutes of prep work (I chop vegetables while watching my favorite reality shows) your slow cooker is set and ready to go. 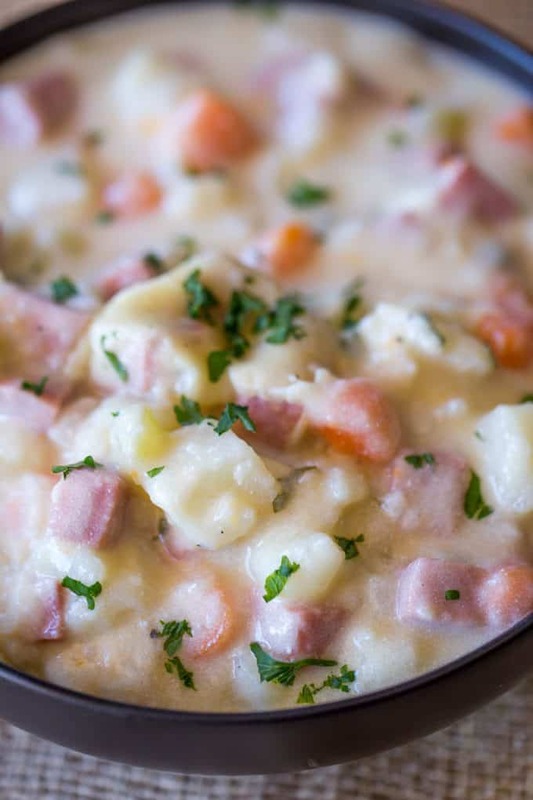 The Slow Cooker Ham and Potato Soup simmers away on its own, melting the vegetables into this delicious creamy base. A quick mash, a bit of heavy cream and sour cream and dinner is served! 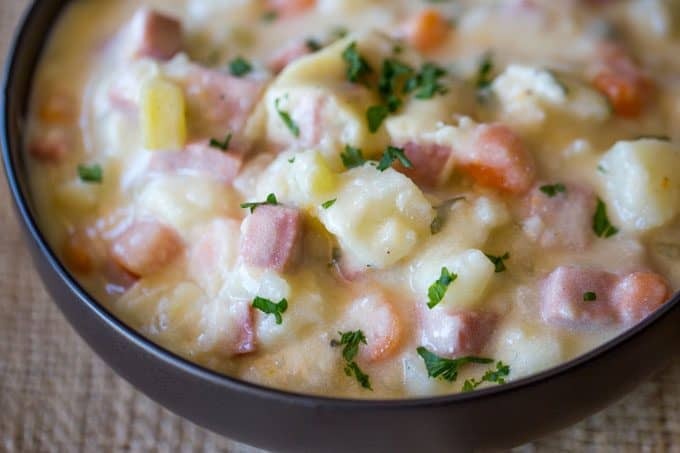 The best part of slow cooker meals like this Slow Cooker Ham and Potato Soup is that they’re perfect for weeknights now that everyone is back to school or for those hearty meals you’re going to need after a day spent out at the soccer fields watching the little ones run around in a pattern that almost resembles soccer (we just started toddler soccer here… and oh boy). 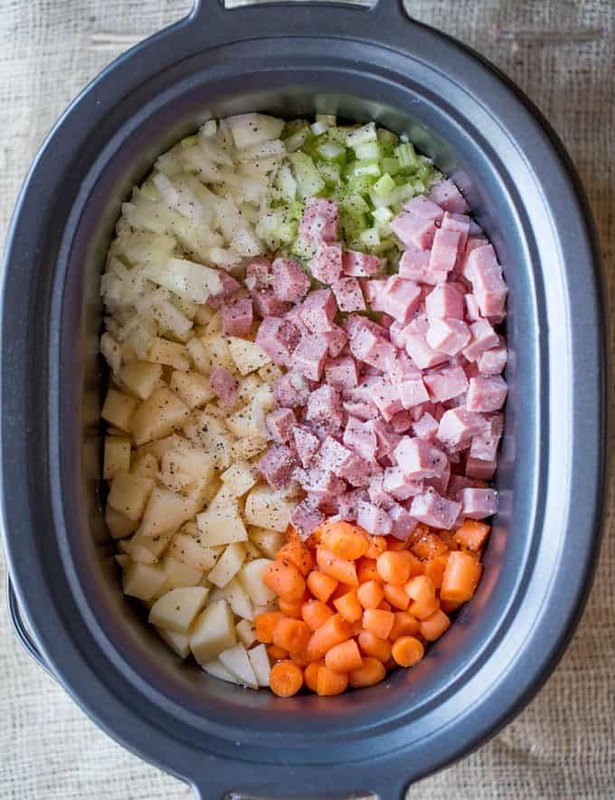 This Slow Cooker Ham and Potato Soup can be ready, waiting for you to come home, peel off the grass covered uniforms and eat! 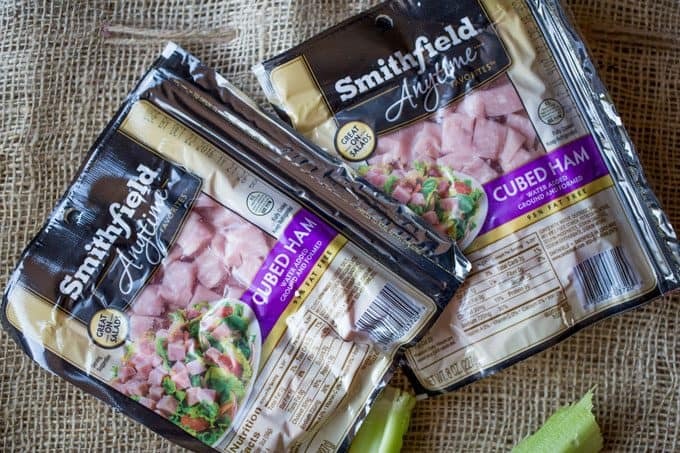 The Smithfield Anytime Favorites Hickory Smoked Cubed Ham used in this recipe was inspired by the flavors of Smithfield Ham which I grew up enjoy for holiday meals, but in really convenient packaging and in almost any cuts you could hope for which helps cut prep time drastically. Better Than Bouillon: I almost never buy boxes of broth because I keep the beef, chicken and vegetable version of this Better Than Bouillon. Spice Rack – I buy spices in bulk from local grocers and from Penzey’s. It’s less expensive and significantly higher quality than buying the jars individually but I ended up being left with tons of little bags of spices. Enter the spice rack. 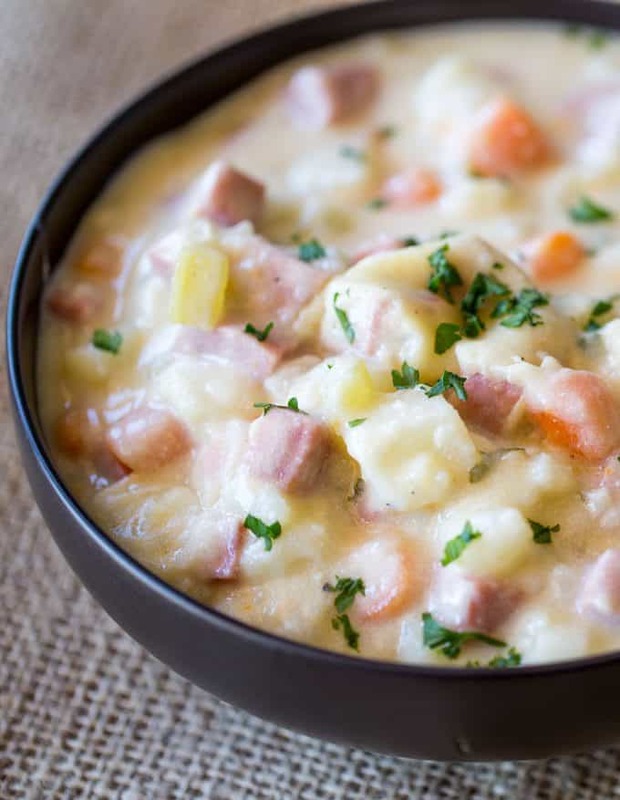 Slow Cooker Ham and Potato Soup that's creamy, full of vegetables and chunks of ham, finished off with milk and sour cream for a easy and delicious hearty soup. 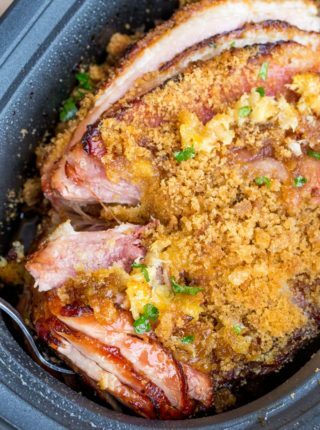 Add the potatoes, onion, carrot, celery, ham, Kosher salt, pepper chicken broth to your slow cooker and cook on low 7-8 hours, or high 4-5 hours. Add the flour, heavy cream/milk and sour cream and stir everything together. My oh my !!!! This was the easiest and most flavourful soup I’ve made in a long time. Love love the creaminess and full bodied combination. Will keep as one of my favourites. Thank you! I’m so glad you enjoyed it, Cindy! Thanks for the 5 stars. This was the best potato ham soup recipe I’ve ever had! I followed it exactly, except I won’t ever use Smithfield pork. The company is now owned by China. Did anyone find the ham to be overcooked? 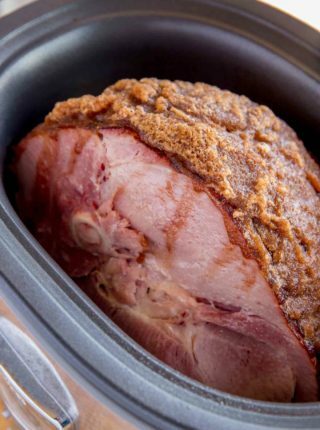 It’s my experience that pre cooked ham doesn’t do well in a slow cooker. 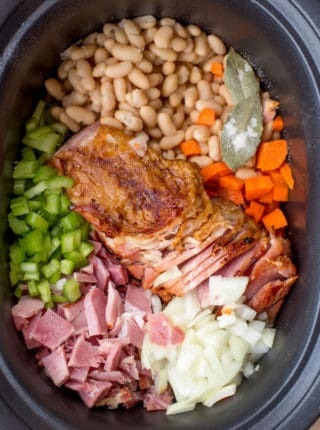 To be safe, I added the ham for the last 30 minutes with the milk and flour. Was delicious.